A year ago, the world reeled after the unutterably tragic shootings at Sandy Hook Elementary School. Last Friday we reeled yet again after another school shooting, this time at Arapahoe High School in Colorado. A year ago, I wrote the following post, because frankly I didn’t know what else to say or do. I’m reposting it 12 months later, but with a few added statistics. I add no perspective, because there isn’t any…. 17 December 2012: Forgive me; today I write to find catharsis. There’ll be none, I know, but I can’t read the whole way through the coverage of the Connecticut shooting victims in one go, and I feel the need to put something into the ether. My 5-year-old son and I play endless games of “20 Questions,” and whenever the category is animal, we ask each other, “Person animal or animal animal?” We both know that they’re the same group, really, and yet something is different about the two. Over the last few days it’s been hard to shake the thought that what separates humans from other animals is our propensity to self-destruct. And when I think about the fools who quote the Second Amendment as a means to safety, I realize that ignorance is on the list too. However, people also crave meaning and context, and I’d like to think that our constant search for deeper understanding makes us collectively a better group of beings than we might otherwise seem. There is no meaning or understanding to the shooting on Friday or to any other tragedy in the world where children are dying, but perhaps we can scramble around for some context. Rain is currently pouring down my window, putting a climatic face to our collective grief, but as it mirrors tears, the rain also stimulates growth. And so today I’ll try to offer some tiny shreds of context and steps toward new growth. People have long ascribed meaning to plants and flowers, perhaps in an effort to better understand the world. If I were to plant a new garden today, I would fill it with context and memory. Here, then, are the makings of a memorial garden for Sandy Hook. 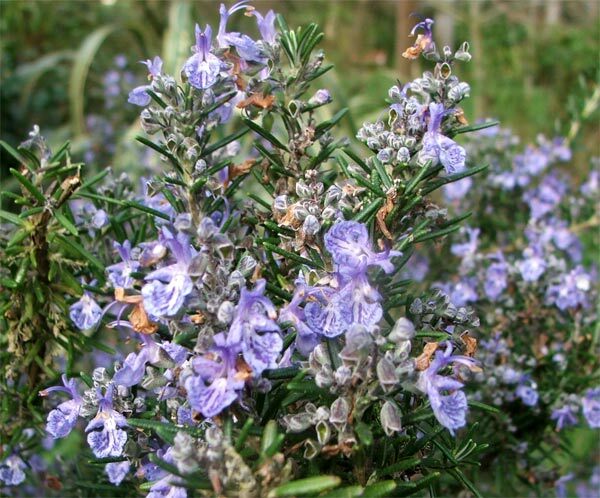 The clear blue of rosemary’s flowers was believed to come from the Virgin’s laying of her cloak on the plant while sleeping. Thus the plant was called the “Rose of Mary.” Minerva, Greek goddess of knowledge, was associated with rosemary, and in Hamlet, tragic Ophelia gives out rosemary after her father’s death, echoing the long-held tradition of rosemary as memento mori. The Victorians identified magnolia with dignity, and its origins in wild swamps align it with perseverance. An Asian and African native, gerberas are sweet and simple and represent enduring purity. Delicate in looks and tough in growth habit, Forget-me-nots are the keepsake plant. Most goddesses of the ancient religions (Juno, Astarte, Eastre, the Virgin Mary) are associated with the lily. Lilies symbolize hope and rebirth as well as death; it is often used as a funeral flower. In the Victorian language of flowers, the lily stood for youthful innocence. Another Western funeral flower, chrysanthemum is considered sacred and noble in China and Japan. Blooming in November, the chrysanthemum stands for the light of hope in dark times. Cultivated by the Aztecs, dahlias represent the transience of beauty. To the ancient Chinese, the gardenia suggested feminine grace. Also known as windflower, anemone was the favorite plant of Zephyr, the Greek god of the west wind. Medieval Christians believed that anemones grew on the hill where Christ’s blood had fallen. Aphrodite grew red anemones from Adonis’s blood as he lay dying. They have long been associated with abandonment and loss. The iris stands for sorrow. The Greek goddess Iris guided souls to eternity after death. The French word for “thought” is “pensée.” Along with rosemary, Ophelia hands pansy to the Danish court after her father’s murder. Usually purple or white, lilacs suggest passion and absence. To the Victorians, they represented the beautiful sadness of love and its omnipresent sense of impending farewell. Native to Mexico and brought to Europe by the Spanish conquistadors, zinnias came to mean absence and the sorrow that goes with it. When the goddess Virgo scattered stardust from the heavens, asters sprung up. They represent the tiny beginnings from which all great things proceed. In Asia, white is the color of death. The Old Testament’s “Song of Solomon” claims that love is “as strong as death.” Contemplate the white rose, whose quiet beauty stands for purity and silence. 16 December 2013: In the year since Newtown, 21 US states passed new legislation to hinder gun violence, including some states with historically weak gun laws, such as Florida, Missouri and Texas. Eight states have managed to pass major gun reform in answer to very strong popular support for sensible gun legislation. However, in the year since the killings at Sandy Hook School, 25 more school shootings took place in America. That’s, on average, one shooting every two weeks, and that number does not include any shootings that occurred on school grounds after school hours. In 2013, Congress failed to pass any new preventative gun violence legislation. Donate to the Brady Center to Prevent Gun Violence. 18 Dec	This entry was published on December 18, 2013 at 11:29 am. It’s filed under Plant Suggestions and tagged context, flowers, meaning, memorial, Newtown, plants, Sandy Hook. Bookmark the permalink. Follow any comments here with the RSS feed for this post.